There's a lot of Pinotage activity on the web this week. On the elevated realms of Robert Parker's wine discussion forum, Port guru Roy Hersh likens aged Pinotage to southern Rhones. He has just opened a 1999 Beyerskloof Pinotage. 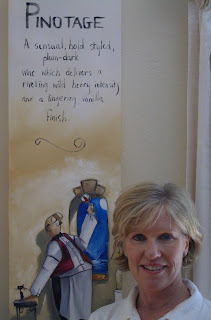 "It is not one of those ungodly wines that those who hate Pinotage would turn their nose up at. 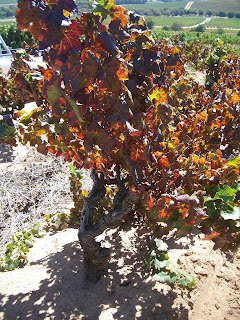 In fact, most people do not age their Pinotage ... unless they know any better. Having tried 20-30 year old examples (in country) I know that some ... can and do become beautiful old wines, but obviously there are not many that do. At just 7-8 years old, this wine is showing beautifully and I'd say at about peak performance. It would still drink well 5+ years from now too, but I don't think it will ever be better than it is today. It is showing a dark crimson color with a clear edge and no signs of maturity in terms of its appearance. The nose is dapper, with a smoky and spicy scent initially but the subtlety wears off and it literally explodes with leather, pine resin and a plum earthiness that is gorgeous (if you like the style). It is closer to the aromatics of a So. Rhone wine than what most people think in terms of as So. African ... no less Pinotage. On the palate it shows great viscosity and the heavy weight is as plush as a deep pile carpet. This is fun to roll around the mouth and we have half a bottle left to enjoy with our steak dinner in a few minutes. But already the prune, tobacco, meaty flavors and clay come to the fore. I don't normally use clay as a descriptor for a flavor profile ... but I think that those 4 ppl. on this BB, that enjoy aged Pinotage know the note I am describing. I have to take a look at the alc. % but there is no signs that this is out of synch. In fact the delicious fruit and acidity are singing already and this was not even decanted!" Another person in love with Beyerskloof is an anonymous lady who blogs under the name 'Classy Rump', although I wonder what her unlucky husband thinks. She sent him out to the farmers market to buy a shoulder of lamb which she slow cooked in Port. 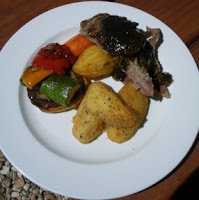 She says "Drank Beyerskloof pinotage, one of my absolute faves, - went perfectly with the spicy lamb. Lovley. Had intended giving Hubs one of my special BJs to cheer him up but crashed out and woke up side by side on the sofa hours later like a pair of tinned sardines." "F*** me - this tastes exactly like Musar!! A eureka moment - a pinotage I actually like, with a velvetty texture and mouthfeel, soft earthy aromas and (surprisingly given the 14.5% alcohol) no astringency on the finish. I don't know if it's the addition of 4% Viognier which has helped it, or if it's just really well made, but this is superb. No jamminess, no medicinal notes, no beefy/smokey flavours - just a really deep yet soft and well rounded wine. Tasted blind I would have sworn it was Musar. I was literally blown away by this wine - I've never tasted a pinotage like it. 91pts." And, ahem, (well there are Pinotage wines featured in it), over at wine.co.za Neil Pendock gave an enthusiastic review of my book Marilyn Merlot and the Naked Grape" and says "Wine pundit for the Observer, Tim Atkin may list “never trust a person who collects wine labels” in his enumeration of the Top 25 Wine Truths, but in the case of Peter May I’m prepared to make an exception. He’s been a judge on the ABSA Top Ten Pinotage Competition and so must be as squeaky clean as a Stelvin screwcap. And on the basis of this collection of wine oddities, even screwier." Isn’t it funny the impression you get about a winery when all you know about it is from the label on its wines? Camberley’s moody black label with its hard to read gold overprinting made me think of a dark gloomy miserable place and it took me until now to discover that nothing could be further from the truth. I’d always known their Pinotages are superb, no doubt about it. But something had put me off visiting the home of that black label. At last I drove up the short access road to find an electronic gate blocking the way. Should I press the intercom button? I was thinking of turning around and leaving when my way out was blocked by an incoming car. The driver called across “Don’t worry, I’ll open it” and, as she pressed a button on a remote control, the gates slid open. I parked at the edge of the garden of a large bungalow on a ridge and got out to meet Gaël Nel, the owner (pictured above). Her winemaker husband John wasn’t there, and she had a dozen tasks to do but she insisted I follow her in to her house. There was a breathtaking view over the valley at the end of their garden. But no sign of a winery. I followed her down some stairs and found myself in a barrel cellar built in what had been the garage. Built on a slope into the hill, this small boutique winery sits under the Nel's house. In a room set aside for tastings, Gaël opened a bottle of their current Pinotage, the 2005 vintage. This WO Stellenbosch Pinotage was purple coloured with soft ripe fruit flavours which filled the mouth with sweet silky texture and some acids on the finish, a most attractive wine. Gaël then opened a new 2006 Pinotage. This had been in the bottle for just three weeks. It had an intense glass staining purple colour with a really spicy front palate, some coffee and chocolate flavours, backed up by some grip and fruit acids on finish. I reckon this will be a real cracker with a little bottle age. Both were really delightful wines, and Gaël was keen to show me their other wines, a Shiraz, Merlot and some Cabernet based blends. But I had taken up enough of her time, I’ll return next trip. And now when I see that Camberley label (pictured right) I think of a warm sun-filled welcoming house on the side of a lush valley and a couple who make great wine in their basement. “Why not come and visit us?” asks Jeremy Walker (Pictured far left with Peter May) - owner/winemaker of Grangehurst Winery when I meet him at a party. So I did. The only previous time I went to Grangehurst, several years ago, the tasting room was closed. This time I couldn’t even find it. I popped into the R44 roadside produce/farm/wine shop that is Mooiberg intending to check directions. And browsing the wineshop, I was approached by a woman who recognised me. Embarrassingly, I couldn't recall where I knew her from but she reminded me she used to be in the Fairview tasting room. Now Marlies Naudé works for Charles Back’s distribution company and was offering tastes of MAN Vintners and the Goats do Roam ranges. The expected rush following the Argus Cycle race the previous day hadn’t materialised so we swapped stories and she got me directions back to Grangehurst. It's up a dirt road and is only identified by the word Grangehurst painted vertically on a gate post. There had been a delivery lorry parked right in front of it earlier, I remembered, because I had to manoeuvre past it and didn't see the sign. Jeremy was at the rear of the tasting room and poured some Grangehurst 2001 Pinotage from an open bottle. “There’s 11% Cabernet Sauvignon in it,” he told me. I found it had a sweet front, seemed quite light bodied for a wine with 14% abv and had noticeable acids on the finish. “You must try this Kautzenburg 2004 (WO Stellenbosch 14.5%abv) that I made here for a neighbour” said Jeremy, opening another bottle. This Pinotage had a lavender perfumed nose, it was full bodied, with gravel spices and wild herb flavour. A most attractive wine that hit the target on all points of the palate. That night I opened the bottle of Grangehurst 2001 Pinotage that Jeremy had kindly given me. And you know what? He’s right – it is a super food wine! The acids I had remarked on in the tasting room were not noticeable. This wine was full bodied, ripe and silky in texture. There were coffee tones on the palate – and now on the nose as well. 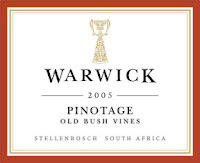 Wine Spectator Online really has got the taste for Pinotage, selecting Warwick's Pinotage as Wine editors Daily Pick for today, 17 March, the third time this month Pinotage has been picked - joining previous picks Kanonkop 04 and Simonsig 04 . Talking of lamb and Pinotage reminds me that last week I called in at Backsberg Estate Cellars near Paarl to update myself with their wine range. A moment later I was sitting at one of those tables, studying the wine list and nibbling on some bread. Lamb wasn’t the only dish on the menu but it is the only item I had eyes for. What to drink? Water obviously and a bottle of Backsberg Pinotage 2006 at R45. Obviously. The waitron* said she would bring my veggies and then I could go and get my meat. A long empty table filled up with a large group under the guidance of a tour guide and although there were a few calls for vegetarian dishes the majority chose the lamb, and without waiting for their potatoes they took their bread plates and formed a line by the spit. 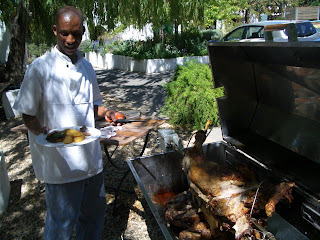 I was fearing all the lamb would all be gone by the time I was served, but the cheerful waitron, returning with my platter, assured me that the tour group was expected and there was plenty of meat for everyone. And so it proved to be. The chef asked which part the animal I preferred (the leg) and how I wanted my meat cooked (medium), and expertly and efficiently carved me off slices of lamb. A nearby table held ample jars of Colmans Hot English mustard (the only one that matters) and thickly gloopy mint sauce – lovely!! Backsberg Pinotage 2006 was very ripe, soft and plummy with some jammy fruit, very drinkable and approachable. A friendly wine and a truly new world Pinotage. 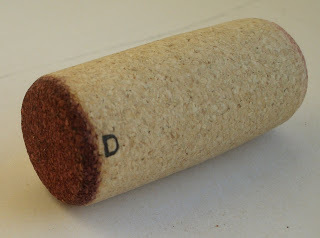 I replaced the cork and took the bottle with me and returned to it the following evening when it was just as delightful. It was 14.5% but didn’t show it and, surprisingly Wine of Origin Coastal when I was expecting from the word Estate in the winery name that it would be WO Paarl. 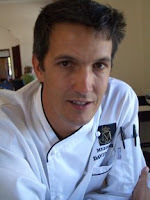 Simon Back, son of Backsberg owner Michael Back (who was at another table in the restaurant. I tipped my straw hat to him, but didn’t interrupt what looked like – from his unhappy expression – a business meeting), blogs at B’s Blog so I asked him. Backsberg vineyards as seen from access road. *Waitron is a most useful South African non-gender specific word for a waiter or waitress. Vino Con Brio in Lodi, California are pleased with the 88 points their 2004 Pinotage was awarded by Steve Heimoff in Wine Enthusiast! who wrote "Dark, thick, soft and juicy, an amazingly flavorful wine with a depth of exotic flavors. Blackberry liqueur, dark chocolate, cherry jam, violet flower, charred beef bones and peppery spice flavors swirl together into a complex finish..." and they recommend Con Brio Cedar Plank Salmon as the perfect food match in this recipe from their current newsletter. Soak cedar plank in salted water for at least 2 hours, then drain. Remove skin from salmon fillet. Remove any remaining bones. Rinse the salmon under cold running water and pat dry with paper towels. Generously season the salmon with salt and pepper on both sides. Lay the salmon (on what was skin-side down) on the cedar plank and carefully spread the mustard over the top and sides. Place the brown sugar in a bowl and crumble between your fingers, then sprinkle over the mustard. Set grill for indirect grilling and heat to medium-high. Place the cedar plank in the center of the hot grate, away from the heat. Cover the grill and cook until cooked through, around 20 to 30 minutes. The internal temperature should read 135 degrees F.
Transfer the salmon and plank to a platter and serve right off the plank with Vino Con Brio's Estate Pinotage. She finds Cabernet Sauvignon “makes the wine taste sour” and Rioja/Tempranillo is “too heavy a grape and loses the rich flavour and aromas of the food”. Rach says Stellenbosch Pinotage makes the best match, and she recommends Kleine Zalze and Beyersksloof Pinotage. Robert Parker is reputed to love the style of wines made by Michel Rolland. What Parker loves he awards big scores to. High Parker scores sell wines and their price soars thus wineries around the world engage Rolland as a wine making consultant in order to make 'Parker' wines. Rolland’s reputation is built on Bordeaux varieties but if you want to know what a Parkerized Pinotage tastes like, mosey along to Marianne Estate, just south of Paarl on the R44. Michel Rolland is a friend of M. Dauriac, who owns Marianne in addition to estates in Bordeaux, and Rolland enjoys staying in the farm’s luxury guest houses. Marianne wines include Merlot, Shiraz, Cabernet Sauvignon and Sauvignon Blanc, two Bordeaux blends and well as Pinotage, all of which I tasted. The wine I thought best, though was their 2004 Chenin Blanc. Unfortunately this is the only vintage since the vines have sadly been replaced. Alone of the red wines, the Pinotage is fermented in stainless steel. 2004 was their first bottling, and the only Pinotage currently available but I was also able to taste the 2005 and 2006 from barrel. The 2004 (68R = 9.25USD/4.75GBP) Pinotage has a dense garnet very young looking but not particularly clear colour and a floral lavender nose. I found it had a strange finish -- sharp volatile stewed, almost burnt. I noted it was ‘interesting’ but I did not like this wine. Much more to my taste was the 2005, back in tank prior to bottling after barrel ageing in old oak. It has good fruit, depth and soft tannins. And the 2006, which was in its tenth month in old oak barrels, was also very approachable. Good berry fruits and structure, some grip on finish. I’d like to taste this wine once it is bottled. For me, there was a very steep improvement over the three vintages, and this farm is definitely one to watch as its 8-15 year old Pinotage vines mature and Rolland gets to grip with Pinotage. Many thanks to Franck Malassigne of Marianne for the tasting, and to Jeanette Stals for making the arrangements. Wine Spectator Online seems to have got the taste for Pinotage, selecting Kanonkop's Pinotage as Wine editors Daily Pick for today, 9 March just four days after Simonsigs 04 Pinotage was selected. It is always a pleasure to drop into the tasting room of Bellevue Estate , managed by Randall Peceur pictured (right) with owner Dirkie Morkel. Bellevue, who now label their wines, for trademark reasons, under the Morkel name, have a special place in Pinotage history. Not only was their wine the very first commercially released Pinotage in 1961– under the Lanzerac label, but the same vineyards are still producing prime Pinotage and they are the worlds oldest documented Pinotage. If you are not already confused by label names, then prepare for two more from Bellevue. First is a new empowerment project wine range - Sizanani. This has a striking label of a tree silhouetted against the sunset and the Sizanani Pinotage 2003 is really very drinkable with soft sweet rounded plum and berry fruits from Bellevue’s young vines. And it is not just me that liked this wine. The buyer from the UK Morrisons supermarket chain just loved it and immediately scooped up two containers worth for their own range labelled ‘Morrisons The Best’. Their tasting note for the 2005 reads "A medium bodied, fruity red wine with subtle hints of wood smoke, vanilla and typical jammy mocha Pinotage flavours. Enjoy on its own or a perfect partner to grilled salmon, sausage casseroles or stuffed mushrooms." Bellevue’s Morkel Pinotage 2005 costs R70 and this is a stunner: really ripe, full bodied, some typical Pinotage sweet mouth feel and there’s quite some complexity there with tannins on the finish. This comes from 30-50 year old bush vines and spent 12 months in 50% new American oak barrels. (whereas the Sizanani/Morrisons used oak staves). Bellevue Estate’s top Pinotage honours Pieter Krige (P K) Morkel who was responsible for conversion of the farm to a wine estate, a famous Springbok rugby player and the man who went out to buy Gamay vines and came back with the new Pinotage variety. 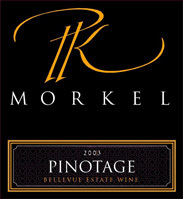 The 2003 P K Morkel Pinotage was a finalist in the 2006 Pinotage Top 10 competition. It offers attractive sweet ripe fruits on the front palate followed by smooth spices, a little coffee and vanilla and a very long finish. “It is feminine and elegant”, says Dirkie. It aged 12 months in new French oak, and is available from the cellar at R90. The 2004 P K Morkel Pinotage is not yet released, but Dirkie kindly gave me an advance taste. This wine spent 18 months in barrel and at this early stage its tannins are quite apparent, especially on the finish. It does open up in the glass where it develops rounded blackberry flavours, but whereas the 2003 is immediately appealing, I think the 2004 needs more time before drinking. However I passed a glass to a friend who preferred it to the 2003 saying it had more flavour and character. 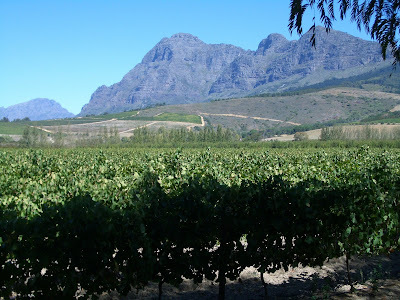 Dornier is a new winery in Stellenbosch whose first bottling was in 2002. The winery building with a sculptured undulating profile that is reflected in a pool in front and echoed by the edge of its wine labels. And, as I mentioned earlier, Dornier was a runner-up in the 2006 Pinotage Top 10 competition with its first Pinotage from the 2004 vintage. 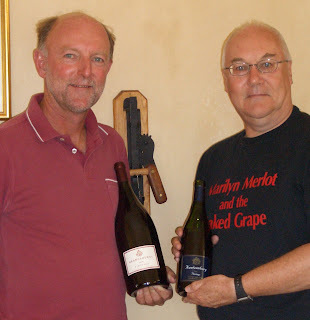 So I was delighted that my old mate and Pinotage enthusiast Keith Prothero had managed to charm winemaker J C Steyn (pictured left) to spare us some time during harvest to open and taste Pinotage with him. The Pinotage had a coffee nose and bright fruit. There was high acidity (“natural” says JC ) and firm tannins on a long lingering finish. I can see why it would stand out at a competition tasting, but I would vigorously decant it before drinking now, but would prefer to keep it for a couple of years. 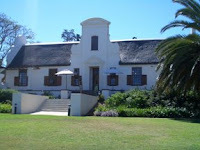 Dornier is worth a visit now to see its stunning California style building (picture - right) and taste its distinctive wines, and soon it'll be a food destination as they are restoring an old Cape Dutch building on the other side of the pool and will be opening it as a bistro later this year. Simonsig Redhill Pinotage 2004 was chosen as Wine Spectator Online editors Daily Pick for today, 5 March. James Molesworth says "Dark, ripe and fleshy, showing lots of plum, currant and blackberry fruit, layered with cocoa powder and tar flavors. The finish is long and muscular, but this also has a sense of polish. Drink now through 2008. 1,000 cases made. 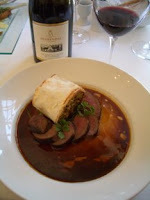 (89 points, $30)"
A world class meal demands a world class wine and at Meerendal Estate (pictured left) I enjoyed both. Meerendal have taken opportunity of the recent change in South Africa’s Wine Of Origin system to register production from single vineyard block. This block, officially identified as number 2D and named The Heritage Block, was planted with Pinotage in 1955, making them the oldest Pinotage vines in the Durbanville area and – by my reckoning – the third oldest in the world. I mentioned earlier that visiting Meerendal to taste this wine would be a must during my time in the Cape.I had the extreme good fortune to meet David Higgs, Meerendal’s General Manager/Executive Chef (pictured right) at Beyerskloof and he immediately invited me to lunch to taste the wine at Meerendal. Meerendal is easy to find – take the R302 exit north from the N1 , and after passing through Durbanville take the left fork onto the M48 and you cannot miss Meerendal on the right. The Estate changed hands a few years ago, and the new owners have great plans – the release of a single vineyard Pinotage is the result of one and there are new building works underway. There is a buzzy Bistro with great views from its deck and a deli stocking produce made on the farm, a function room and a chapel whichjis a favourite spot for weddings. And the old manor house (pictured above) houses the sophisticated Wheatfields restaurant. The last of the Pinotage was being harvested although Heritage Block was already in tank undergoing malolactic fermentation. Meerendal do their alcoholic fermentation in kuipes - traditional open tanks. Each of the 20 tanks can hold 5 tons, so Meerendal can handle 100 tons of grapes at a time. Winemaker Liza Goodwin told me that the 2005 vintage was the first where the grapes from the Heritage Block had been handled separately. “Everything is done by hand,”she told me, “from picking through to labeling the bottles.” She pointed at a small team of workers carefully placing the heavy paper engraved labels on the bottles - which have been imported especially. They weigh 1 kg and have a very deep punt. The 2006 vintage is in barrel. Lisa poured a taste in my glass. It had a good structure, subtle mulberry flavours of great depth and a long finish, on which wooding was apparent. “It has been in barrel 15 months and I expect to be bottling it next month,” said Lisa. In Wheatfields restuarant I chose Oven roasted Springbok, with sweet potato and honey rolled in crispy filo pastry on a bed of shredded mangetout which had been flash fried with some pancetta and homemade smoked chili, on rosemary gravy (pictured right) This dish was exceptional, with the mangetout outstanding being so crispy. One of the best meals I have eaten, and priced at just 90R. With it we tasted Meerendal Pinotage 2003. This had a ripe fruity nose and although not overt there were rich silky berry flavours and an underlying sweet mouthfeel. A classy wine. The single vineyard Heritage Block Pinotage 2005 was opened. "It was just bottled in December 06," Dave Higgs told me. There was a bright nose, it was exciting and youthful and a little perky, with dense mulberry and grip on the finish. We agreed it needed more bottle age. Having seen how well the 2003 has fared, I'd wouldn't open this wine till 2010 at the earliest. I found it difficult to choose just one dish from the menu of this excellent menu, but it is hard to image a meal more enjoyable than my roast springbok with its 'salad of pancetta, mangetout, and smoked chili'. Executive Chef Dave Higgs, Head Chef Stephen Fraser and their team (they are training local youngsters in their kitchens) are cooking up a wow. New York’s FOOD & WINE magazine (May 2006 issue) named Wheatfields in their List Of Hottest Restaurants In The World, one of just seven restaurants in the Cape. I have no doubt Dave and Stephen will go far in their profession and we wil be hearing much more of them in the future. And as for The Heritage Block Pinotage: only 300 cases were made of this special initial 2005 vintage, so don't delay in in laying down some down. You'll be thanking me in 2010. Since L’Avenir joined the Laroche family of wineries and thus gained the benefit of their international distribution network, worldwide demand for their Pinotage has soared by 50%. “I am installing drip irrigation,” said Tinus, “because we cannot afford anymore to lose half our crop due to heat waves.” To help meet popular demand a new range, Pinotage by L’Avenir, produced from grapes sourced from other farms, will be introduced,. And the neighbouring Sentinel farm has been acquired. Sentinels' distinctive castle building that looks down on the R44 just north of Stellenbosch will eventually become – after remodelling – the L’Avenir tasting room and function centre. Tinus is currently in the midst of the vintage (picture right – Tinus checking grape ripeness). Pinotage was picked two weeks early this year. It is fermenting, and Tinus has high expectations for this, his second vintage at L’Avenir. He is also pleased with the 2006 vintage nearing the end of its time in barrels. Soon he will be choosing the barrels intended for the premium Grand Vin Pinotage (previously Reserve). It will be a difficult task, for I’d be happy to see any one of the barrels of 2006 Pinotages I tasted from this week to be selected. I'd like to thank Tinus for letting me taste the new vintage and maturing cellar wines and allowing me to accompany him to the vineyards at such a busy time.